This package offers royal delight times three - a tour of Schoenbrunn Palace, an exclusive dinner at Café-Restaurant Residenz as well as the grand finale – a concert of classical music with works by Wolfgang Amadeus Mozart and the Strauss family at the Orangery. Empress Maria Theresia appreciated the unique atmosphere of Schoenbrunn Palace and made it her summer residence. Emperor Franz Joseph I is said to have had a special predilection for the sumptuous palace and its park. Choose this package to feel the spell of times long past! 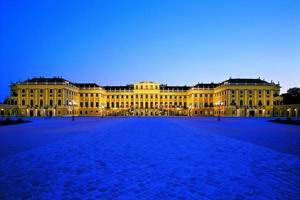 An audioguide will accompany you on the tour of the private chambers and ceremonial rooms of Schoenbrunn Palace. Café-Restaurant Residenz is located in the so-called Ehrenhof („Court of Honor“), adjacent to the palace‘s main entrance. An elegant three-course candlelight dinner awaits you. In summer, dinner will be served in the cozy outside dining area. Menu may vary depending on the season. The concert takes place at a location that played an important role throughout Mozart‘s career: the elaborately restored Schoenbrunn Palace Orangery. It was frequently used as the perfect location for sumptuous festivities back in the times of the royalty.The musical performance of the renowned Schoenbrunn Palace Orchestra, accompanied by vocalists and ballet dancers, captivates the audience each and everyevening.